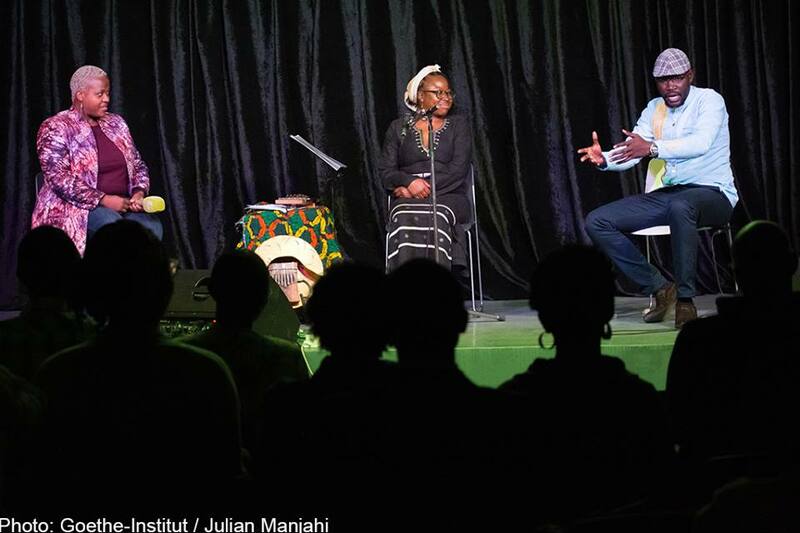 The brilliance of Prudence Katomeni and Adipo Sidang’ was on display when they performed at the Goethe-Institut Nairobi’s Artistic Encounters on June 14, 2018. The event was curated by Zukiswa Wanner. Artistic Encounters that happens at the Goethe-Institut Nairobi brings together two artists to share their art in front of an audience together. The project curated by Kenyan based South African Zukiswa Wanner has seen artists from Kenya, Germany, South Africa, Sierra Leone, Nigeria, and Gambia on the stage in Nairobi. They include artist Victor Ehikhamenor and poet Koleka Putuma, trumpeter Christine Kamau and poet Philipp Khabo Koepsell, novelist Lola Shoneyin and storyteller Maimouna Jallow, author Angela Makholwa and actress Patricia Kihoro as well as novelist, short story writer and academic Pede Hollist and actor Hana Kefela. June 14 was the date for the newest edition of the popular series. Followers of popular culture will know that this was the day that the FIFA World Cup in Russia was having its opening ceremony but this did not prevent a full house being seen at the German Cultural Centre. On stage were Zimbabwe mbira player and vocalist Prudence Katomeni and Kenyan poet Adipo Sidang. Prudence Katomeni not only has one of the most soulful voices in the Southern African country but plays the Mbira. A household name in Zimbabwe for her work in music and film, Katomeni has toured extensively in the UK, Germany and Norway among other countries. Adipo Sidang’ is a Nairobi based poet with a poetry collection entitled Parliament of Owls which debuted in 2016. Apart from being a poet, Sidang’ is also a writer of Young Adult fiction with his book A Boy Named Koko winning the local edition of the Burt Award for African Literature in 2017. The two had two sessions where Katomeni played the Mbira and sung weaving it in with Sidang reciting his poetry. In between the performances, series curator Zukiswa Wanner had a moderated discussion with the two about their craft and other topics of interest. After the performances, audience members got copies of the book of the poet and the CD of the singer and had them signed. So well did the two enjoy their collaboration that the next day they recorded a single of their collaboration of Sidang’s popular poem, Hawiyoo. You can view some of the video of the performance below. Here are some images from the evening courtesy of the Goethe/Julian Manjahi. Pingback: Niq Mhlongo, Nick Ndeda for Goethe’s Artistic Encounters. Previous Previous post: Kukogho Iruesiri Samson is GT Bank Dusty Manuscript Prize 2018 winner. Next Next post: BBC International Radio Playwriting Competition 2018 shortlist announced.